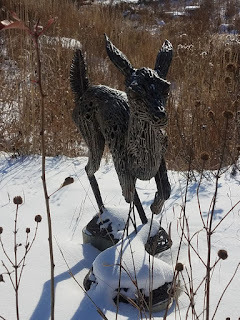 Have you noticed that little deer dashing through the snow at Scott Park in Champaign? Just peek through the tall grasses along the Boneyard Creek. 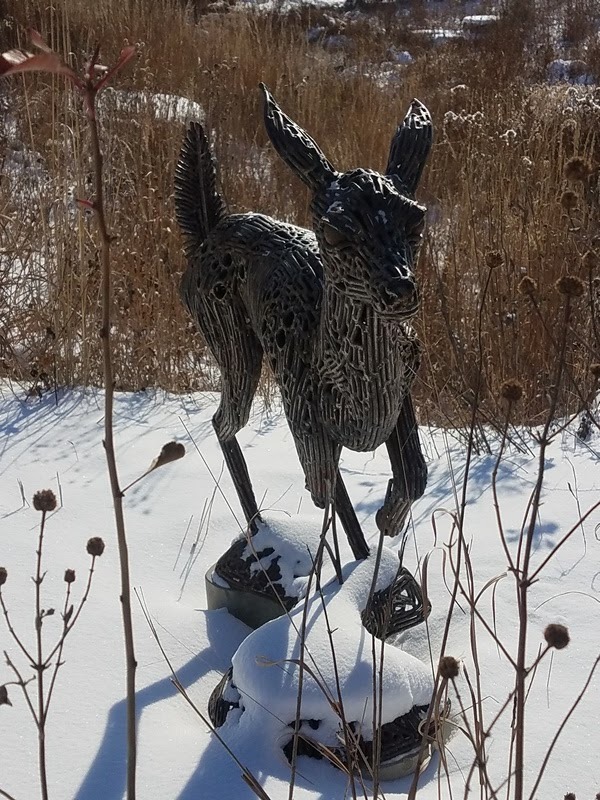 The Public Art League is proud to introduce you to Startled by local artist, Timothy Summerville of St. Joseph. We are excited to have been able to purchase the piece with funds donated by Tod and Beth Satterthwaite of Champaign. 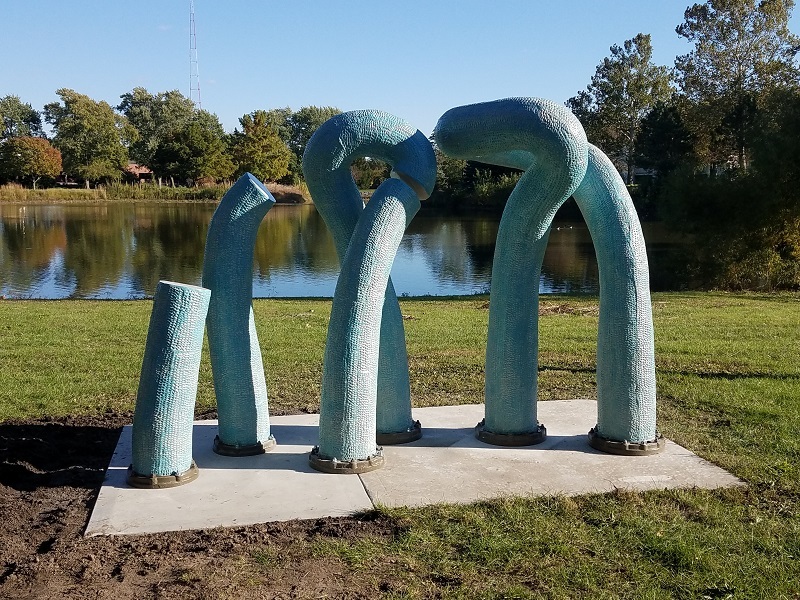 Startled is the 9th piece installed through the PAL program in 2017 and was done so through our partnership with the Champaign Park District. Keep an eye out for Startled as it may show up in the natural areas of other parks around Champaign. 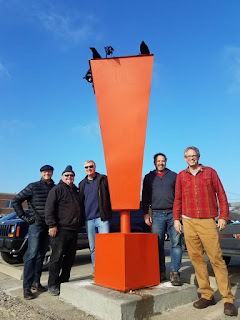 "Critic's Corner" Perches High Above Springfield Ave.
From L to R: David Wilcoxen (Board President, PAL), Judd Nelson (Artist), Mike Hosier (Site Sponsor), Craig Snyder (Artist), James Barham (Director, PAL Board). The Public Art League is proud to welcome Critic's Corner by Judd Nelson and Craig Snyder (Wayzata, MN) to Champaign. The sculpture has been installed on the north side of Springfield Ave. between Neil St. and the railroad viaduct. The sculpture is constructed of welded plate steel painted bright orange and stands high over the street and sidewalk. The artists indicate that the piece is a mixture of sculptural styles that meld together. 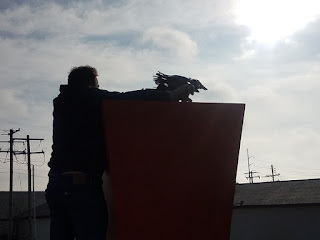 Also, the piece has been known to be a popular perch for local birds. 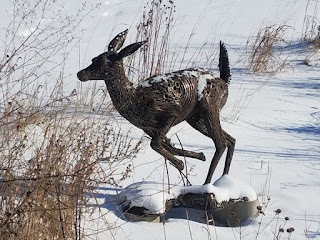 A big thanks go out to Mike and Connie Hosier for the Site Sponsorship of this piece. You are invited to our annual Installation Celebration. 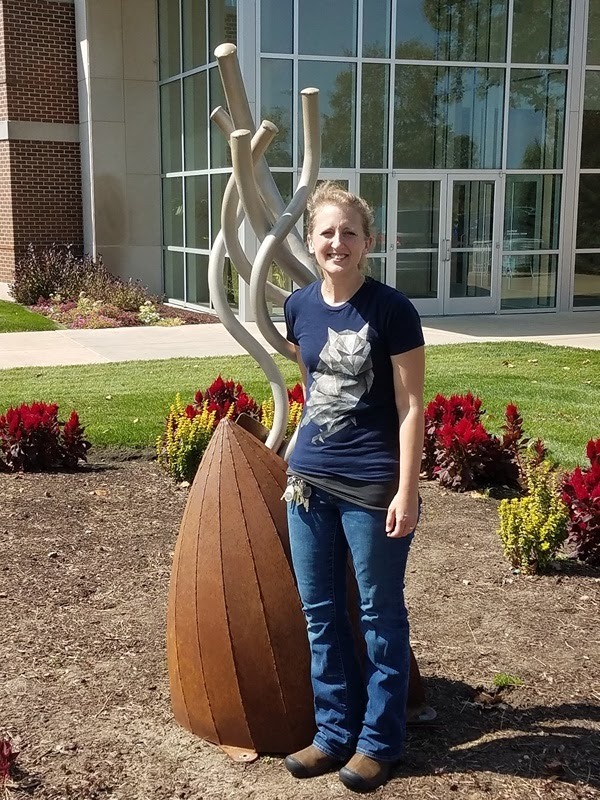 On the evening of December 12th, 2017, we will be celebrating the installation of several new sculptures in the Champaign-Urbana area over the past year. 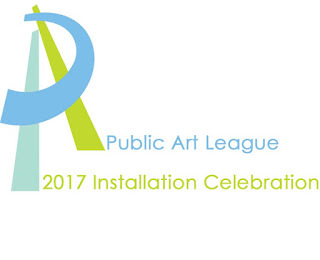 Please join us for a night of drink, food and friends of the Public Art League! Please RSVP by December 9th. Thank you for your support! We would love to have you join is for the event! If you are unable, please consider a donation to further our mission by clicking here. The Public Art League proudly welcomes Loop by artist Jim Weitzel (Forest City, NC) to Mattis Park in Champaign. 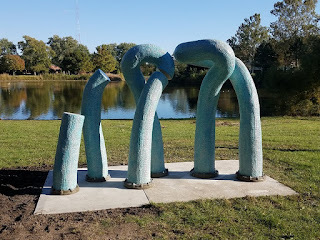 Loop is a sculpture made on a wire armature that is covered with bonding cement onto which the artist has incised small marks and then applied stain. The sculpture is filled with high-density foam for added strength and to stop water migration. Of Loop, the artist states: "The sculpture is about energy; there is the energy of all those small marks and then my goal was to make the arms of the sculpture appear to emerge from the earth and show how the energy is disrupted until it can make the final loop back around and re-enter the ground." 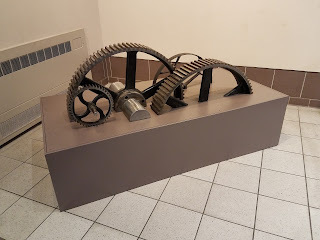 "I saw this sculpture in a dream. In the dream, it was composed of maybe thirty sections that formed a circle and was flowing water. This piece is my effort to realize that vision in a three-dimensional form. 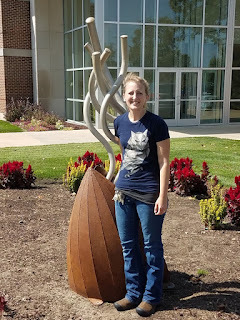 The sculpture was created of a few years' time and completed in 2015." "This is, of course, a metaphor for our lives and the human struggle. All the energy that it takes to be a person and how we have fits and starts until we close the loop and become truly human." 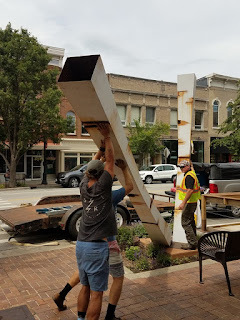 A big thanks to James Barham and Barham Benefit Group for the site sponsorship of this piece. 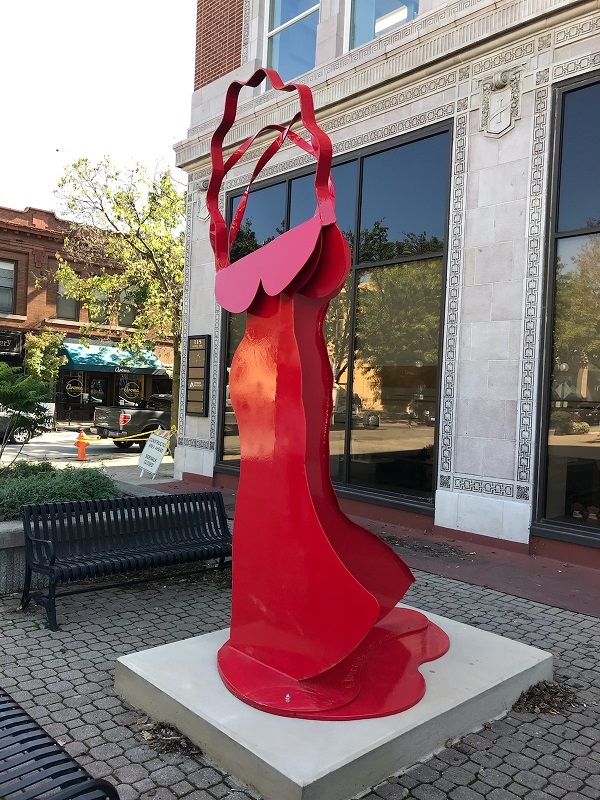 "La Diva II" - A Vibrant Addition to Downtown Champaign! The Public Art League proudly welcomes La Diva II by Ruth Aizuss Migdal (Chicago, IL) to the corner of Neil Street and Park Ave. in Downtown Champaign. 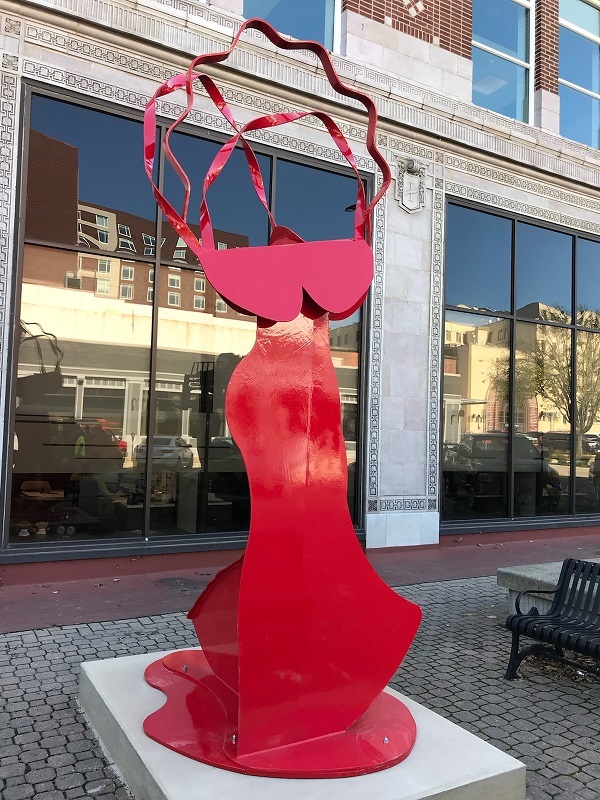 The sculpture stands 12 feet tall and is constructed of fabricated steel painted bright red. The artist states: "La Diva II exhibits what it is to be a strong, independent woman full of life and beauty. It captures the individual strength in all of us. The larger-than-life, vividly red sculpture is a celebration of life. It activates its surroundings by bringing to it a bold presence." La Diva II is the second of the artist's work to be featured in the community. 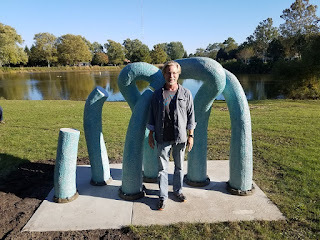 The majestic Flamenco Revisited (also by Migdal) is installed in Porter Park in Southwest Champaign. 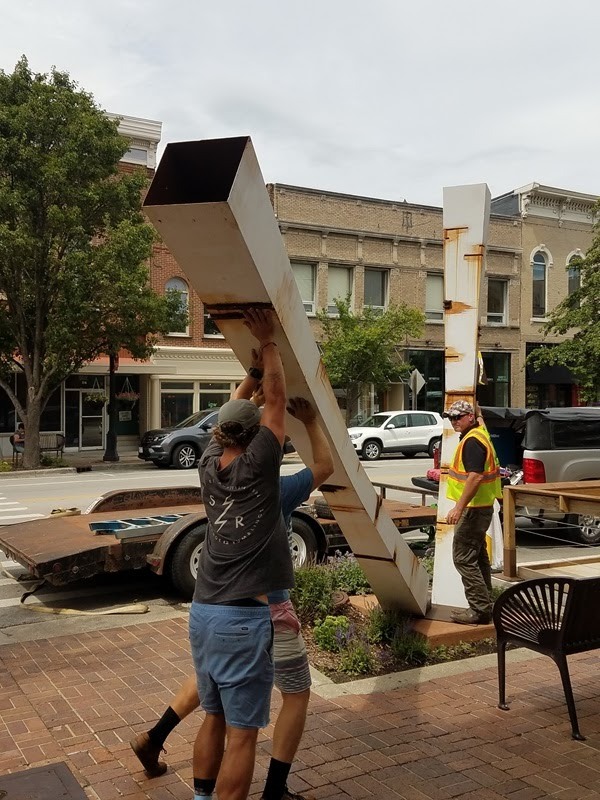 A big thank you to Robin Allen & Dan Noel, Whitney & Andrew Hartman, Masha & Brent Trenhaile and the Friends of PAL for the site sponsorship of this piece. The Public Art League is proud to welcome Quarter Moon by Carl Billingsley (Greensboro, NC) to downtown Champaign. 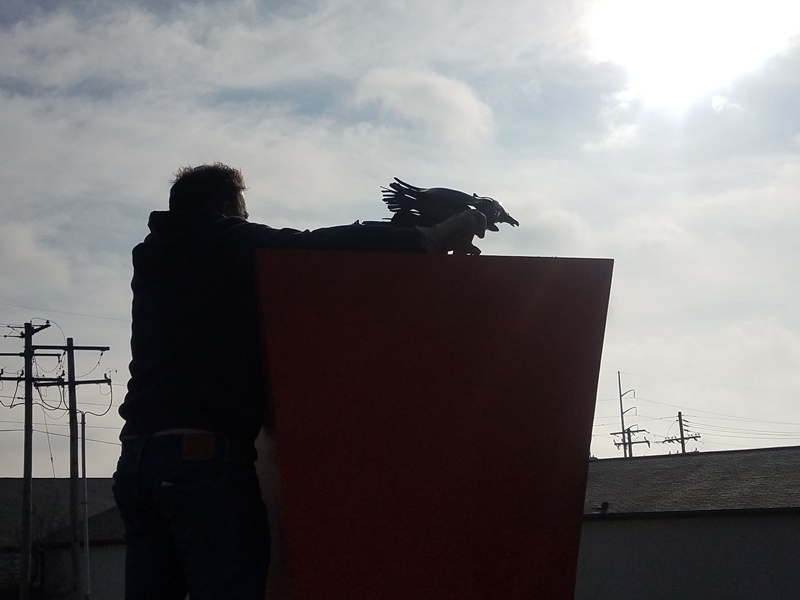 The piece is installed near the Gold Rush Pawn Shop on the north side of Main. 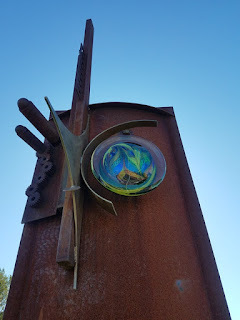 The artist states: "Quarter Moon is an exploration of a vertical motif. 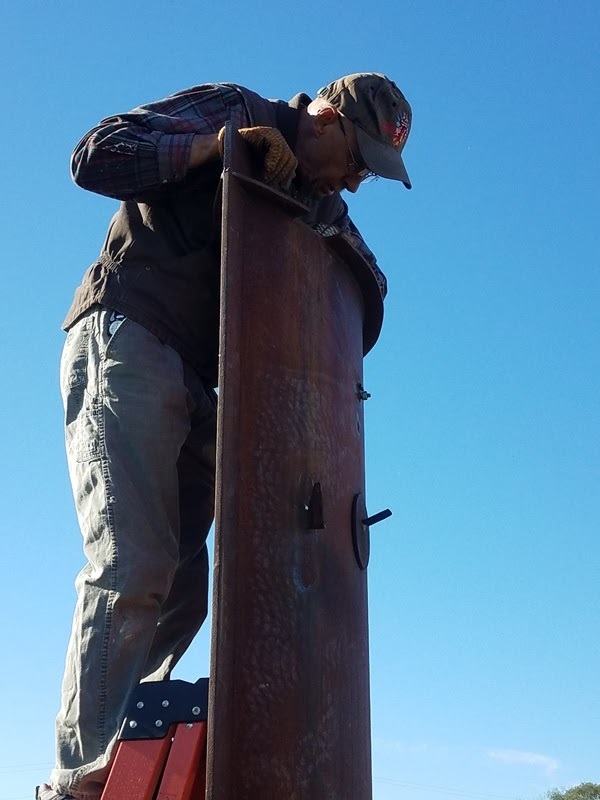 It is constructed of standard industrial steel shapes such as I-Beams, and various sizes of pipe that are welded and mechanically attached. 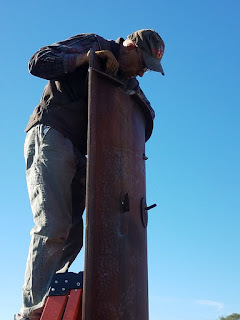 The technique that I employed in constructing Quarter Moon is also industrial and continues the tradition of 19th century 'constructivists' who introduced industrial materials and techniques to 'fine art.' 'Economy of means' and 'the hand of the artist' are both expressive aspects of the sculpture that any viewer can see and readily understand. Quarter Moon is a unique and somewhat mysterious object that enlivens the public space and references the natural world symbolically by employing universal design elements such as color, planes, lines and circles in a sort of poetry of object and space." A big thanks goes out to Jos. Kuhn & Co. for the site sponsorship of this piece. We thank them for their continued support of public art in our community. 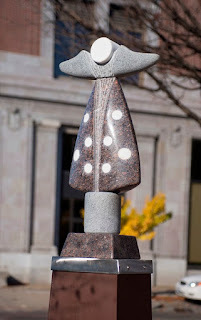 The Public Art League is proud to announce the purchase of Dakota Memories (artist: Shawn Morin). The purchase was made possible with a generous donation from Fred and Donna Giertz. 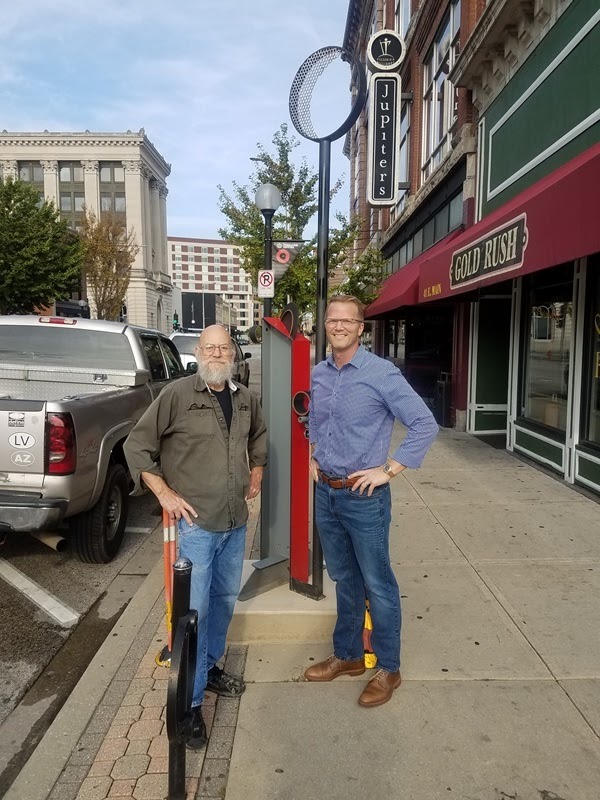 Dakota Memories came to the community in 2015 and is installed at the Northeast corner of Neil and Chester Streets in downtown Champaign. The piece is made primarily of Mount Rushmore granite and serves as a remembrance of times the artist spent working with the Dakota Granite Company on a project in Sioux Falls, SD. 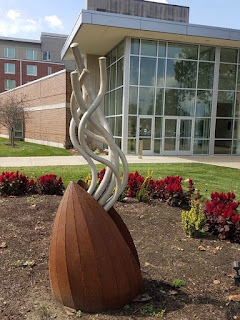 Dakota Memories is installed just steps away from another Shawn Morin piece, Remembering Horeb. 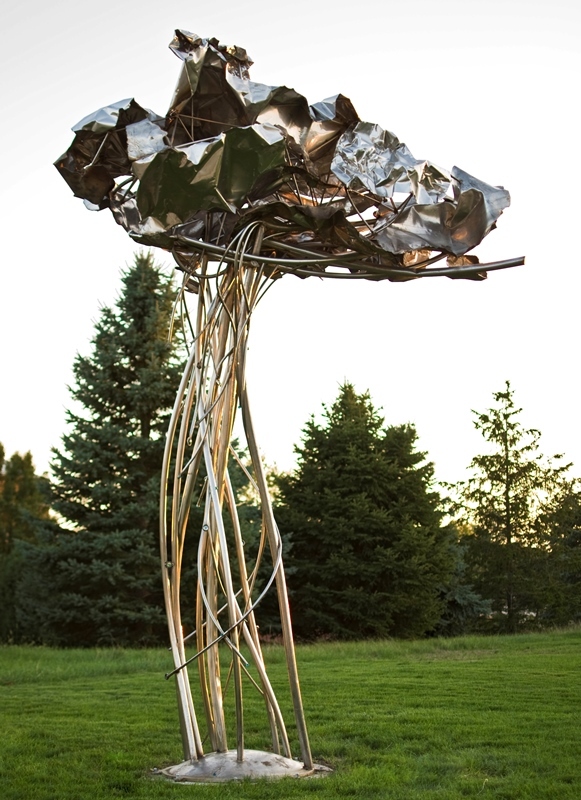 That piece was also purchased by The Public Art League in a previous year (with a donation from Barham Benefit Group). We are happy that Dakota Memories will be staying in the community and thank Fred and Donna Giertz for their generosity. 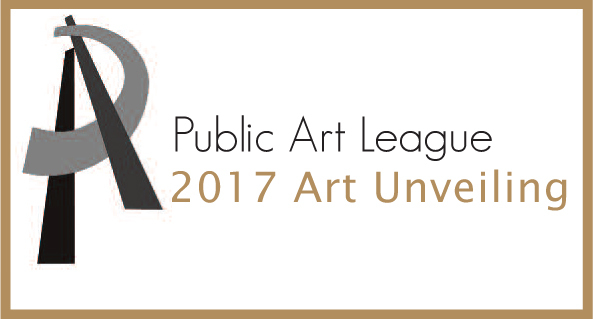 The Public Art League is featured in the January 2017 episode of Art Now! on Urbana Public Television (UPTV). The show is produced by The Urbana Public Arts Program and Commission in collaboration with UPTV. 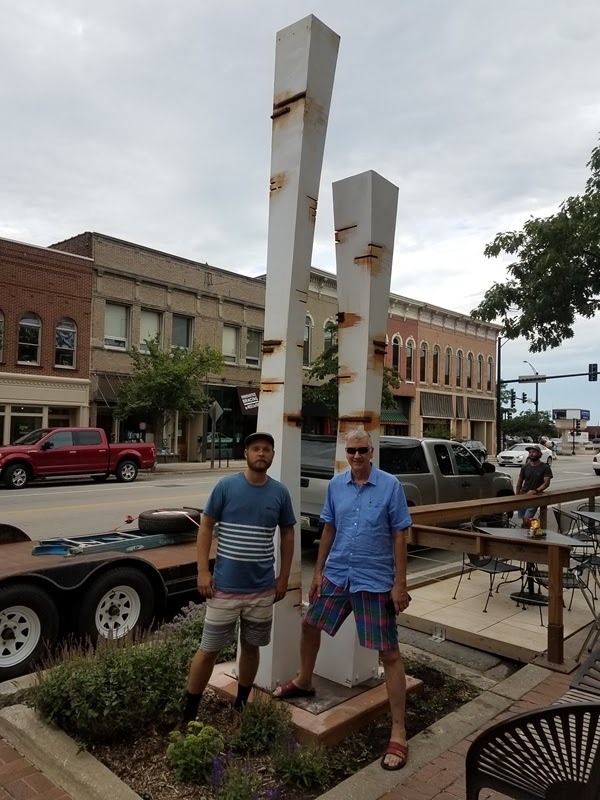 The episode features interviews with artist Michael Collins (created Beacon, currently installed in Downtown Champaign), sponsor and advocate Ginny Waaler (donated toward the purchase of Stranger Reduction Zone and other local pieces), and Eric Robeson (PAL board). 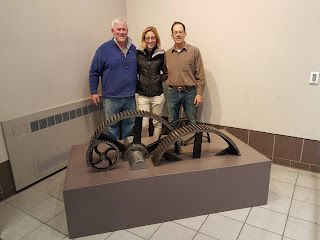 Thank you to Urbana Public Art Coordinator, Pauline Tannos, and Director/Editor, Jason Liggett, for their work on the show.